Old Order Mennonites are a related group to the Amish. In Wisconsin, there are two types of Old Order Mennonites: Groffdale and Weaverland. The Groffdale Mennonites travel by horse-and-buggy. 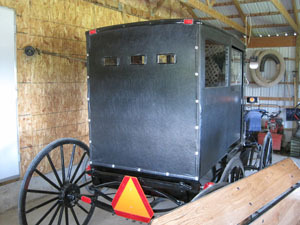 The Weaverland Mennonites travel by black car. Who are the Old Order Mennonites? Mennonites share religious origins with the Amish, having roots in the Radical Reformation of the early sixteenth century in Europe. These reformers wanted to further change the Protestant movement in Switzerland by advocating for adult baptism, insisting on the separation of church and state, and supporting a non-resistant lifestyle. In a period of religious turmoil, where citizenship was often determined by baptism into a church, these reforms were met with strong resistance. Because they re-baptized themselves into their new church as adults, adherents became known as Anabaptists. They were persecuted throughout Europe, being tortured, hunted, and burned for their beliefs. Many were forced to worship secretly in homes or caves. In the late seventeenth century, the Swiss-South German Anabaptist branch was split when Jakob Ammann pushed for stricter regulations on dress and appearance. He insisted on having communion twice a year and wanted to institute the ritual of footwashing based on precendent from the New Testament. His stance on shunning wayward members brought strong opposition from some Anabaptists and, in 1693, the group divided into Amish and Mennonites. Unlike most Old Order Amish, the Old Order Mennonites worship every Sunday in a meetinghouse. Groffdale Mennonites use archaic German for the written liturgy, while the Weaverland Mennonites use English. In Wisconsin, there are four Weaverland churches: Pine Grove, Marathon, Clark View and Shady Grove. The largest concentration of Weaverland Mennonites is in Clark County. 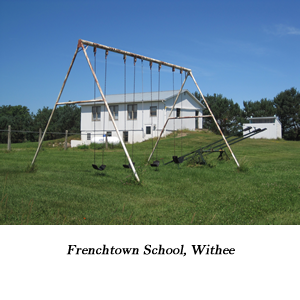 There are two settlements of Groffdale Mennonites in Wisconsin. The largest by far is in Clark County; the smaller settlement is in Grant County. The Clark County settlement has five churches: Longwood, Meadow Brook, Stanley, Sunny Ridge, and Colby. Similar to the Amish, much of Old Order Mennonite society is determined by Gelassenheit (yielding, submission). Thus, tradition and uniformity dictate most aspects of Old Order Mennonite life. Unlike the Amish, the Groffdale and Weaverland Mennonites each have one distinct Ordnung. Dress of all Old Order Mennonites is plain. Men wear button-down shirts (usually plaid) with suspenders and jeans. They wear white shirts and black vests for church. Women wear plain dresses with an attached cape. The dress often has a floral print. Outside they wear floral aprons and matching large bonnets. Women's prayer coverings are white mesh: white strings for unmarried girls, black for married women. Young girls typically have their hair in braids and do not wear prayer coverings except for church. Old Order Mennonites are permitted to have telephones in their homes and electricity. Many youngsters play the harmonica and accordion and practice singing on Saturday evenings. Also unlike the Old Order Amish, Groffdale Mennonites readily use tractors for fieldwork. However, the Groffdale Mennonites in Wisconsin (like those in Pennsylvania) are not permitted to have rubber tires on the tractors. Old Order Mennonite children are schooled in one- or two-rooms schools by teachers in the community. Similar to the Amish, Old Order Mennonites end schooling around eighth grade, though some states require teens to keep vocational school diaries or complete other projects when they begin work. The Groffdale Mennonites in Wisconsin number nearly 2,000 and first arrived from Pennsylvania in 1974. Since they are considerably smaller in population size than the more visible Amish, the Old Order Mennonites' interactions with outsiders often goes unnoticed or confused with the Amish. However, the Old Order Mennonites have had some unpleasant encounters with outsiders in Wisconsin. In 1995, their local store Hene Supply was the target of robbery and arson. 2 Today it remains one of the community's largest suppliers of hardware and groceries. The Old Order Mennonites readily engage in produce stands and microbusinesses from home like the Amish. Visitors and residents of Clark County often patronize their stores shelving bulk grocery items, books, plants, and fresh produce. 1 Donald B. Kraybill and James P. Hurd, Horse-and-Buggy Mennonites: Hoofbeats of Humility in a Postmodern World (University Park, PA: Penn State Press, 2006). 2. Susan Lambert Smith, "Mennonites Perplexed by Acts of Vandalism," Wisconsin State Journal, November 3, 1995, 2A.